The Midland Railway route from Derby to Manchester traversed the Peak District of limestone hills. It was this limestone which produced much traffic for the railway, the ICI works around Buxton provided steam haulage up to 1968. 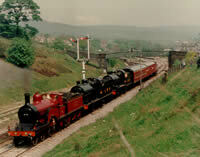 First there is an introduction to the route using the last steam hauled train over the entire route in 1968. Beginning at Derby we go north to Wirksworth and its quarry. A detailed look at the Cromford and High Peak line with its steep incline at Sheep Pasture, J94’s storming Hopton incline, even a B1 at Parsley Hay. Steam around Rowsley where the long climb to Peak Forest begins. We follow the route and stop off at Millers Dale for a trip up the Buxton branch with push-pull trains hauled by 2P 0-4-4T tank engines 58083 and 41905. There are 8F’s in the snow at Buxton and Patriot 45522 turns up from Manchester. Chinley with its four track main line down to Gowhole yards. Peak Forest, Dove Holes and Chinley North and South Junctions. Chinley with a Midland Spinner, absolutely unique film from 1980. Buxton and Gowhole yards,New Mills with it’s branch following the original Midland Railway route to Manchester through Birch Vale, Bredbury and Woodley with fine views at Brinnington and then down through Stockport Tiviot Dale, Georges Road to Heaton Mersey. The shed at Heaton Mersey is seen from 1962 to closure in 1968. London expresses pass Cheadle Heath and a commuter service to Manchester Central was still worked by steam in 1965. We see Royal Scots, 4F and 2-6-4 tanks. Finally a journey along the now closed route through Didsbury and Chorlton brings the film to an end at Manchester Central. Once again this video covers an area in great detail and well filmed. This entry was posted in Volumes 50-59 and tagged 1980, 4F, 8F, Chinley, Derby, Heaton, London, Manchester, Midland, Peak District, Peak Forest, quarry, Royal Scot, steam, Stockport. Bookmark the permalink.